The top map shows the first party preference by electorate. The bottom map shows the final two-party preferred vote result by electorate. The 2019 New South Wales state election was held on Saturday 23 March 2019 to elect the 57th Parliament of New South Wales, including all 93 seats in the Legislative Assembly and 21 of the 42 seats in the Legislative Council. The election was conducted by the New South Wales Electoral Commission (NSWEC). The two-term incumbent Liberal/National Coalition Government led by Premier Gladys Berejiklian and Deputy Premier John Barilaro was re-elected to a third four-year term with a reduced majority in the Legislative Assembly, where government is formed. The main Opposition Labor Party under Michael Daley won an increased share of the vote in most districts, though the party was unable to successfully gain support in key marginal electorates. Minor parties the Greens and the Shooters, Fishers and Farmers Party, as well as several independent MPs, also contested the election. ABC election analyst Antony Green called the election for the Coalition at about 8:15pm, over two hours after the 6:00pm close of polling booths. However, it took a further two full days of official vote counting by the electoral commission before the ABC election computer was able to project that the Coalition had retained majority government. Ultimately, the Coalition won 48 seats (35 Liberal, 13 National), suffering a loss of six seats from the 2015 election, providing the incumbent government with a slim two-seat majority. The Labor Party won 36 seats, an increase of two seats. Labor, and to a larger extent the Coalition, both suffered primary vote swings against them. Minor parties the Greens and the Shooters, Fishers and Farmers each won three seats, and they were joined on the crossbench by three independents. In the Legislative Council, 21 seats were up for election. The Coalition won eight seats, Labor seven, the Greens and One Nation each picked up two seats, whilst the Shooters, Fishers and Farmers Party and Animal Justice Party claimed one seat each. One Nation's lead candidate Mark Latham, who led the Labor Party to defeat at the 2004 federal election, was elected to the Council. In total the Coalition held 17 seats, Labor 14 and crossbenchers of other parties held 11. The result left the Berejiklian Government needing at least five votes to pass legislation, up from the two they needed in the previous Council. It was the first time that the Coalition won a third consecutive term in office in New South Wales since the 1971 state election. Berejiklian became the first woman to lead a party to a state election victory in New South Wales, as well as the third woman to lead a party to a victory at a state election in Australia (after Queensland's Anna Bligh and Annastacia Palaszczuk) and the first non-Labor woman to do so. Daley had initially indicated that he would stay on as leader despite the loss. However, facing the prospect of a leadership spill, Daley announced several days after the election that he would stand down as leader and not contest a subsequent leadership election, to be held after the upcoming federal election. Deputy leader Penny Sharpe will serve as interim leader of the party in the intervening period. New South Wales has compulsory voting, with optional preferential voting in single-member seats for the lower house and single transferable vote with optional preferential above-the-line voting in the proportionally represented upper house. Compared with results from 2015 election. despite a very large swing, their 22.7-point margin in 2015 is used for swing calculations. lost by the Coalition since 2015 occurred from even larger swings, both won by two new crossbenchers. At the 2015 election, the Coalition retained government with a reduced majority of 54 seats from 69 seats in the 2011 election. In the course of the previous parliamentary term, the Coalition had been reduced to 61 seats due to ICAC proceedings that resulted in the departure of eight MPs from the Liberal Party. The Labor Party gained 11 seats at the election, for a total of 34 seats. The Greens gained a record three seats whilst independents Greg Piper and Alex Greenwich both retained their seats. Several by-elections were held after the 2015 election. In most of these, the party holding the seat did not change. There were two exceptions to this. In the 2016 Orange by-election, Philip Donato of the Shooters, Fishers and Farmers Party won the seat, previously held by the Nationals. In the 2018 Wagga Wagga by-election, independent candidate Joe McGirr won the seat, previously held by the Liberal Party. The 2015 election saw the incumbent Liberal/National coalition gain one seat in the Legislative Council to have a total of 20 seats, despite a 5.1-point swing against them. The Labor Party lost two seats, bringing their total down to 12; the Greens, Shooters and Fishers, and Christian Democrats saw no gains or losses in the election: these parties won five seats, two seats and two seats, respectively. The only gain came from the Animal Justice Party. The Liberal Party campaign was launched by Premier Gladys Berejiklian on 10 March. The event was attended by Prime Minister Scott Morrison, former Prime Minister John Howard, and former New South Wales Premiers Mike Baird, Barry O'Farrell, John Fahey, and Nick Greiner. Berejiklian announced that, if re-elected, the government would spend $2 billion over four years to construct two metro rail line: one from the Sydney CBD to Parramatta and one from St Marys station to the planned Western Sydney Airport. She also pledged to build or upgrade 29 hospitals and clinics state-wide, including redevelopments of the Bankstown Lidcombe Hospital and John Hunter Hospital at a cost of $1.3 billion and $780 million, respectively. Another $917 million was pledged for the construction of eight new schools and the upgrade of 31 others. Another $120 million is to be spent expanding before and after school care to "ensure that every public primary school student in NSW can access before and after school care from 7 am to 6 pm." The Labor Party campaign was launched by Opposition Leader Michael Daley on 10 March. The event was attended by federal Labor leader and Leader of the Opposition Bill Shorten, as well as former New South Wales Premiers Kristina Keneally, Bob Carr, and Barrie Unsworth. Daley committed to spending $2.7 billion over ten years to fund public schools, recruiting 5,000 new teachers and aiming to make New South Wales the first state to commit to the Gonski school funding model. $250 million was pledged in funding for mental health care, with Daley stating that Labor will hire more nurses in mental health wards and introduce nurse-to-patient ratios. Labor also committed to banning conversion therapy and decriminalization of abortion and also to have abortion performed within public hospitals if elected. A $1 billion water fund was announced for the purpose of upgrading water infrastructure and protecting the water supply of regional communities, particularly in times of drought. On 19 March, a September 2018 video surfaced in which opposition leader Daley made negative comments about Asian immigration in Sydney: "Our young children will flee and who are they being replaced with? They are being replaced by young people from typically Asia with PhDs... So there's a transformation happening in Sydney now where our kids are moving out and foreigners are moving in and taking their jobs." Daley apologised for his comments, stating "What I was referring to was housing affordability in Sydney ... I could've expressed myself better, no offence was meant." Labor's preference deals with the Shooters, Fishers and Farmers Party was criticised by Premier Berejiklian, who suggested that a Labor government supported by the Shooters could lead to looser gun laws. Daley responded by pledging to resign from parliament if gun laws were changed, even if the measures were passed by the Coalition. In light of the National Party's preference deal with the Liberal Democrats, Labor leader Daley accused Berejiklian of hypocrisy for criticising Labor's preference deals with the Shooters Party while her own coalition partner offered preferences to the Liberal Democrats, whose platform includes even more extreme positions on gun laws than the Shooters. Berejiklian stated that the deal was not comparable as it only concerned the upper house, and would not affect government formation, which occurs in the lower house. The incumbent Liberal government planned to continue with the demolition of the Sydney Football Stadium and, if re-elected, to replace it with a new $730 million venue. The Labor Party oppose the demolition. The issue was thrust into the limelight by Peter FitzSimons, a local media figure, who remarked that he believed that the Government would not win the election unless they cancelled the stadium rebuild. On 9 March, Labor unveiled its plan for a "war on waste", seeking to ban single-use plastic bags, phase out single-use plastic, and reduce waste and create jobs by investing $140 million in recycling initiatives. Pauline Hanson's One Nation under the leadership of Mark Latham ran on a platform which opposed immigration, congestion, overdevelopment and renewable power, and proposed DNA tests for Aboriginal welfare recipients and banning the burqa in government buildings. The first debate of the campaign was held on 8 March on the ABC. It featured Premier Gladys Berejiklian and Opposition Leader Michael Daley, and was moderated by Brigid Glanville. Subjects discussed included the demolition of the Sydney Football Stadium, cost of living in Sydney, transportation, infrastructure, and the Murray–Darling basin. In their final remarks, Berejiklian pledged to continue the current course and finish pending projects, while Daley emphasised his commitment to regional voters and promised assistance for dairy farmers. A second debate was held on 20 March on Sky News featuring Premier Gladys Berejiklian and Opposition Leader Michael Daley, moderated by David Speers. An audience of 100 undecided voters asked questions to the two leaders. Issues discussed included stadium funding, climate change, domestic violence, TAFE funding, the M4 motorway toll. When questioned on Labor's planned TAFE funding increase, Daley was unable to provide a precise figure. Berejiklian was also unable to clarify whether motorists would be charged a toll to travel on the M4 from Parramatta to Penrith. The audience were subsequently asked who they were more inclined to vote for after the debate. 50 favoured Berejiklian, while 25 favoured Daley; a further 25 were undecided. In February 2019, it was reported that Shooters, Fishers and Farmers Party and Pauline Hanson's One Nation sent preferences each other's way in the upper house. Labor leader Michael Daley said the party's head office, instead of the leader's, would decide preference deals on a "seat-by-seat basis". While refusing to rule out Labor dealing with the Shooters, Fishers and Farmers, Daley said Labor would not accept a preference deal with One Nation "because they are a racist party". The National Party made preference deals with the Liberal Democrats and Christian Democratic Party in the Legislative Council, suggesting that voters give them second and third preferences respectively. 18 parties are registered with the New South Wales Electoral Commission (NSWEC). All eighteen parties nominated candidates for election to the Legislative Council. The seat of Wollondilly was vacated following the resignation of Liberal MP Jai Rowell on 17 December 2018. The parliament has fixed four-year terms with the election held on the fourth Saturday in March, though the Governor may dissolve the house sooner on the advice of the Premier. Aggregate data of voting intention from all opinion polling since the last election. A local regression trend is shown in a solid line. * Indicates a combined Liberal/National primary vote. The ReachTEL poll on 10 September 2018 includes 5.9% of undecided voters. The ReachTEL poll on 29 November 2018 includes 3.1% of undecided voters. The YouGov-Galaxy poll on 28-29 November 2018 includes 5% of undecided voters. The Sunday newspapers both endorsed the Liberal/National Party Coalition over the Labor Party. The Sun-Herald described Berejiklian's Coalition Government as "solid and safe custodians, and—despite eight years in power and two relatively orderly leadership transitions—there is no particular sense that the Coalition has worn out its welcome". While highlighting her strengths in infrastructure and economic management, it warned that "the electorate tends to respond to a leader who can articulate a more uplifting vision". It contrasted this against Daley, where "questions linger over whether he and his team are ready to govern, partly because of how recently he was thrust into the job, partly because of past connections to tainted figures in the last Labor government and partly of his own making". The Sunday Telegraph pointed out that despite having commenced many large scale infrastructure projects "the problem for the Government is that nothing is quite finished yet". Despite this, it singled out the Labor Opposition for not having "done enough to atone for the sins of its recent history" of corruption. It called for stability of leadership after a decade of instability, recommending to voters that they "should give the Government the opportunity to see through the transformation of our state". All four weekday newspapers endorsed the Liberal/National Party Coalition over the Labor Party. The Green Left Weekly endorsed Socialist Alliance. The Red Flag endorsed voting for both Socialist Alliance and the Greens. ^ Compared with results at 2015 election. The Coalition held 46 seats at the dissolution of parliament following the Orange by-election and early retirement of Jai Rowell, MP for Wollondilly. ^ Compared with results at 2015 election. SFF held 1 seat at the dissolution of parliament following the Orange by-election. ^ This figure includes Justin Field MLC, who was not up for election this year. He left the Greens to sit as an independent in April 2019, before the final composition of the Council was determined. ^ "NSW election delivers wins for Shooters, Fishers and Farmers, while Greens retain seats". ABC News. 23 March 2019. ^ "NSW election result confirmed, Gladys Berejiklian's Coalition wins 47th seat". ABC News. 25 March 2019. ^ "Results: NSW Election 2019". ABC Elections. ^ a b c d "One Nation wins two upper house seats in the NSW Parliament". The Sydney Morning Herald. 15 April 2019. ^ "Gladys Berejiklian praised as she becomes NSW's first elected female premier". The Sydney Morning Herald. 24 March 2019. ^ "Gladys Berejiklian rules out alliances with independents and minor parties". ABC News (Australia). 24 March 2019. ^ "Michael Daley won't contest NSW Labor leadership after losing election". The Guardian. 26 March 2019. Retrieved 26 March 2019. ^ "NSW STATE ELECTION RESULTS 2019". NSWEC. 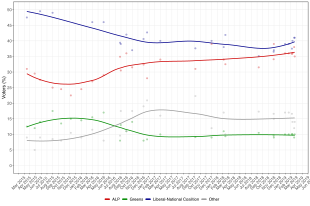 ^ "NSW 2019 Results: Party Totals". ABC Elections. ABC. ^ "Changing seats". Australian Broadcasting Corporation. Retrieved 25 November 2018. ^ "Legislative Council - State Election 2019". vtr.elections.nsw.gov.au. Retrieved 26 March 2019. ^ "'NSW should have it all': Berejiklian launches re-election campaign". Sydney Morning Herald. 10 March 2019. Retrieved 2019-03-11. ^ "NSW election battlelines drawn as Liberals, Labor launch campaigns". ABC News. Australia. 10 March 2019. Retrieved 2019-03-11. ^ "NSW Labor pledges 5000 extra teachers for public schools". Sydney Morning Herald. 11 March 2019. Retrieved 2019-03-11. ^ "NSW Labor leader Michael Daley apologises for foreign workers comment". SBS News. Retrieved 2019-03-20. ^ "Michael Daley claims Asian workers taking young people's jobs in Sydney". Guardian Australia. Retrieved 2019-03-20. ^ "'They've accepted what I've said': Daley forced to explain himself over immigrant comments". Sydney Morning Herald. 19 March 2019. Retrieved 2019-03-19. ^ a b Smith, Alexandra; O'Sullivan, Matt (3 February 2019). "Berejiklian rules out deal with Shooters Party to hold power". The Sydney Morning Herald. Retrieved 9 March 2019. ^ Sarah, Gerathy (17 March 2019). "Daley says 'I'll resign' if NSW guns laws change but deal with Shooters Party remains". ABC News. Retrieved 22 March 2019. ^ Visentin, Lisa (21 March 2019). "National Party asks voters to support pro-gun Liberal Democrats". Sydney Morning Herald. Retrieved 22 March 2019. ^ Rabe, Tom (22 March 2019). "NSW premier under fire over preferences". Port News. Retrieved 22 March 2019. ^ Hinds, Offsiders columnist Richard (8 March 2019). "Sydney stadium debate more to do with blood politics than sport". ABC News. Retrieved 9 March 2019. ^ Haydar, Nour (5 March 2019). "Alan Jones told on air he'll be sacked from SCG Trust if Labor wins election". ABC News. Retrieved 9 March 2019. ^ "Labor unveils war on waste". MichaelDaley.com. 9 March 2019. Retrieved 2019-03-11. ^ "NSW election win likely for Mark Latham in Upper House seat for One Nation". ABC News. 23 March 2019. Retrieved 23 March 2019. ^ "'Ban sexist burqa in government buildings, banks and airports' says Latham". Starts at 60. 29 January 2019. Retrieved 7 February 2019. ^ "NSW Votes: Leaders' Debate, Friday 8 March". ABC News. Australia. 7 March 2019. Retrieved 2019-03-08. ^ "Fiery NSW election leaders debate, Gladys Berejiklian tells Michael Daley 'just be honest'". ABC News. Australia. 8 March 2019. Retrieved 2019-03-08. ^ "NSW election: Gladys Berejiklian emerges victorious after People's Forum debate in Western Sydney". News.com.au. 20 March 2019. Retrieved 2019-03-20. ^ "NNSW political leaders fumble over details in debate". Financial Review. 20 March 2019. Retrieved 2019-03-21. ^ "State Register of Parties". NSW Electorial Commission. 17 January 2019. Retrieved 20 January 2019. ^ "New South Wales 2019 Election - Legislative Council – Ballot Paper" (PDF). NSW Electorial Commission. 8 March 2019. Retrieved 10 March 2019. ^ "Wollondilly MP Jai Rowell officially steps down". Camden-Narellan Advertiser. 17 December 2018. Retrieved 31 December 2018. ^ Sas, Nick (9 November 2018). "Luke Foley says he won't re-contest, with battle for NSW Labor leadership now between two". Australian Broadcasting Corporation. ^ "ALP takes a Wong turn". Daily Telegraph. 13 June 2018. ^ Bunn, Anthony (1 August 2018). "Member for Albury Greg Aplin has opted not to stand in next year's NSW election due to health concerns". The Border Mail. ^ Costin, Luke (4 August 2018). "Two scandals in one term: MP won't recontest south-western Sydney seat". The Sydney Morning Herald. ^ Glanville, Brigid (19 December 2018). "NSW Minister Pru Goward announces retirement from politics". ABC News. Retrieved 19 December 2018. ^ Dickins, Roma; Layt, Jess (28 September 2018). "Chris Patterson announces he will not contest Camden seat at March election". Campbelltown-Macarthur Advertiser. ^ "Treasurer rattled in question time". Sydney Morning Herald. 26 September 2018. ^ Kirkwood, Ian (12 November 2018). "Catherine Cusack rolls Scot MacDonald in state Liberal upper house preselection". Lakes Mail. ^ Deans, Matt (14 June 2018). "Andrew Fraser to retire at the 2019 State Election". Coffs Coast Advocate. ^ Broome, Hamish (30 June 2017). "Lismore MP Thomas George announces retirement". Northern Star. Retrieved 30 June 2017. ^ "Troy Grant, NSW Minister for Police, will not contest the next election". ABC News. 12 July 2018. Retrieved 13 July 2018. ^ Druce, Alex (1 June 2017). "NSW Nationals MP Kevin Humphries won't recontest Barwon at the 2019 election". The Land. ^ Visentin, Lisa (5 February 2019). ""I didn't see it coming": Shooters' lead candidate knifed ahead of state election". The Sydney Morning Herald. ^ "So when is the next election?". Aph.gov.au. 1 September 2016. Retrieved 28 September 2017. ^ "Sydney news: Poll reveals NSW election remains deadlocked, police make fresh murder appeal". Retrieved 20 March 2019. ^ "NSW election set to be close". Retrieved 11 March 2019. ^ Tovey, Josephine (2019-02-17). "Essential poll shows one in four NSW voters opting for minor parties". The Guardian. ISSN 0261-3077. Retrieved 2019-02-18. ^ Smith, Alexandra (9 March 2019). "Sentiment may seem clear but NSW is still the Coalition's to lose". The Sydney Morning Herald. Retrieved 10 March 2019. ^ "Gladys Berejiklian facing minority government after NSW election: Newspoll". Retrieved 30 January 2019. ^ "Berejiklian set to lose as internal Liberal chaos derails election hopes". Daily Telegraph. Retrieved 1 December 2018. ^ Smith, Alexandra. "Berejiklian set to lose as internal Liberal chaos derails election hopes". Sydney Morning Herald. Retrieved 1 December 2018. ^ Smith, Alexandra. "VCoalition neck and neck with Labor as Foley overtakes Berejiklian". The Sydney Morning Herald. Retrieved 23 September 2018. ^ Smith, Alexandra. "Voter revolt on stadiums poses threat to Premier". The Canberra Times. Retrieved 18 March 2018. ^ Karp, Paul. "Gladys Berejiklian's Coalition trails Labor in Guardian Essential polls". The Guardian. Retrieved 9 January 2018. ^ "Poll shows Gladys Berejiklian holding her own but minor parties on the march". ReachTEL. 9 October 2017. ^ "Newspoll: Gladys Berejiklian in strong start to NSW premiership". Newspoll. 7 April 2017. ^ "ReachTEL: 55–45 to Coalition in New South Wales". Crikey. 20 January 2017. ^ "Fairfax-ReachTel poll shows NSW premier Mike Baird bouncing back". Fairfax-ReachTel. 3 December 2016. ^ "Baird Government drops behind for first time in NSW; Barnett in trouble in Western Australia while Andrews Government still riding high in Victoria despite CFA union dispute". Roy Morgan Research. 10 October 2016. ^ "Newspoll: Dogs ban sends Mike Baird ratings into freefall". Newspoll. 29 September 2016. ^ "Now 'too close to call' in New South Wales as Baird support slips while ALP has slight lead in Western Australia and a clear lead in Victoria". Roy Morgan Research. 8 September 2016. ^ "Support for Mike Baird's government collapses: exclusive poll". The Sydney Morning Herald. 27 August 2016. Retrieved 27 August 2016. ^ "L-NP in front in NSW & WA and ALP well in front in Victoria but parties dead-level in Queensland after LNP elect new Leader Tim Nicholls". Roy Morgan Research. 1 June 2016. ^ "ALP increases support in all Australian States. Queensland electors narrowly turn down new election after Referendum on 4-year terms successful". Roy Morgan Research. 1 April 2016. ^ "Nick Xenophon Team (NXT) increases support in South Australia while L-NP well in front in NSW and ALP holds solid lead in Victoria". Roy Morgan Research. Roy Morgan Research. 3 February 2016. Retrieved 4 March 2016. ^ "Nick Xenophon Team (NXT) scores highly in South Australia while ALP vote down in Victoria but still maintains strong lead". Roy Morgan Research. Roy Morgan Research. 8 December 2015. Retrieved 4 March 2016. ^ "Popular Premiers Mike Baird & Daniel Andrews have large leads in NSW & Victoria while other States are close". Roy Morgan Research. Roy Morgan Research. Retrieved 17 October 2015. 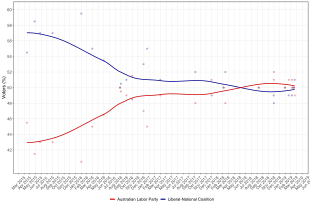 ^ "Newspoll" (PDF). The Australian. 25 September 2015. Retrieved 25 September 2015. ^ "Popular Premiers Mike Baird & Daniel Andrews have large leads in NSW & Victoria while other States except Tasmania are close". Roy Morgan Research. 3 September 2015. Retrieved 3 September 2015. ^ "Mike Baird & Daniel Andrews have large leads in NSW & Victoria while Annastacia Palaszczuk regains lead in Queensland". Roy Morgan. Retrieved 9 March 2019. ^ "Honeymoons continue for NSW Premier Baird & Victorian Premier Andrews while the honeymoon is over for Queensland Premier Palaszczuk". Roy Morgan. Retrieved 9 March 2019. ^ "NSW Premier Mike Baird enjoys clear honeymoon lead; Voters in Queensland back Premier Palaszczuk after strong stance on Billy Gordon". Roy Morgan. Retrieved 9 March 2019. ^ a b "A week to go and the election is the Coalition's to lose". Sun-Herald. 17 March 2019. ^ a b "Our best chance is Gladys". Sunday Telegraph. 17 March 2019. p. 102. ^ "NSW Coalition deserves to finish job it started". The Australian Financial Review. 21 March 2019. Retrieved 21 March 2019. ^ "Coalition is best option to keep state safe and strong". The Australian. 22 March 2019. Retrieved 22 March 2019. ^ "Coalition deserves a third term to get the job done". The Sydney Morning Herald. 22 March 2019. Retrieved 22 March 2019. ^ "Gladys Berejiklian and team earned another term". The Daily Telegraph. 22 March 2019. Retrieved 22 March 2019. ^ a b "Making sustainable transport a reality". Green Left Weekly. 22 February 2019. Retrieved 22 March 2019. ^ a b Lees, Josh. "NSW election: a road to nowhere | Red Flag". redflag.org.au. Retrieved 22 March 2019. ^ "Newspapers endorse Gladys Berejiklian ahead of NSW election". Mediaweek. 22 March 2019. Retrieved 22 March 2019. This page was last edited on 17 April 2019, at 01:00 (UTC).